This warm and hearty roast pumpkin and smoked sweet corn salad is easy to prepare and healthy to enjoy! This mouth-watering recipe, published in Monday Morning Cooking Club’s latest book ‘It’s Always About the Food’, comes from the kitchen of Sydney’s Dov Sokoni. The Monday Morning Cooking Club girls have added a new dimension to the salad by double-smoking (with applewood chips) the sweetcorn and the tahini dressing. Preheat the oven to 200°C (400°F/Gas 6). Line a baking tray (or use a non-stick baking tray). 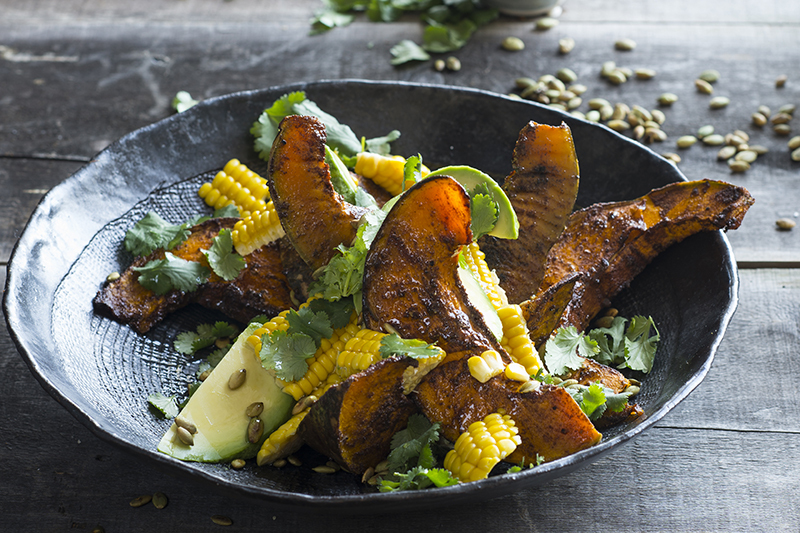 In a small bowl, mix the cumin, cinnamon and brown sugar together and sprinkle over both sides of the pumpkin wedges. Lay the pumpkin side by side on the prepared tray. Season with salt and pepper, drizzle with the olive oil and roast for 20 minutes or until soft and just starting to brown at the edges. In the meantime, bring a saucepan of salted water to the boil and cook the sweetcorn for 4 minutes. Remove the sweetcorn with tongs and transfer to a large glass bowl. Immediately cover with plastic wrap and smoke for 3 minutes. Remove the plastic wrap and place the corn on a chopping board. With a sharp knife, cut sections of the kernels off the cob, leaving some strips of kernels intact where possible. Return the sweetcorn to the bowl and smoke for an additional 3 minutes. In a small dry frying pan, toast the pepitas over medium heat for 5 minutes or until they start to pop and turn brown. Remove and set aside. To make the tahina sauce, in a bowl, place the tahini and lemon juice and mix until thick. Add the water slowly, stirring until a runny sauce forms. Don’t worry, it will thicken before becoming runny. Add the garlic, salt and pepper. Cover with plastic wrap and smoke for 3 minutes. Stir the tahina sauce, re-cover and smoke for an additional 3 minutes. On a serving platter, arrange the pumpkin slices and drizzle with half of the tahina sauce. Sprinkle with the sweetcorn, pepitas, avocado and coriander, leaving some for garnish. Drizzle with the remaining tahini sauce, then scatter with the garnish.